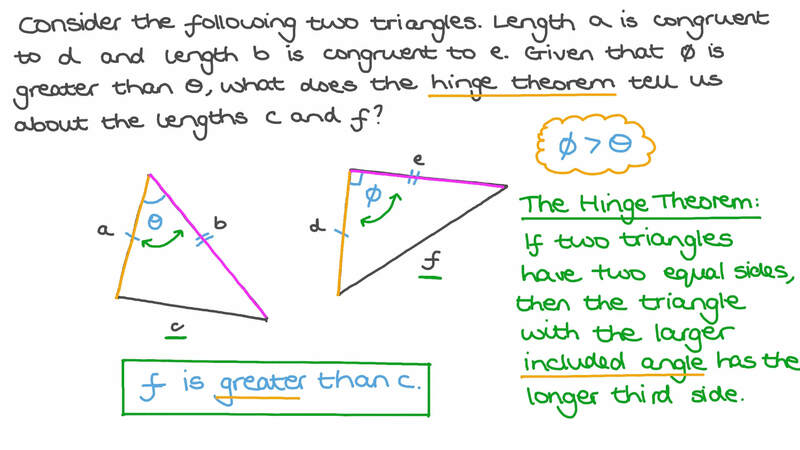 In this lesson, we will learn how to use the hinge theorem. Consider the following two triangles. Length 𝑎 is congruent to 𝑑 and length 𝑏 is congruent to 𝑒 . Given that 𝜙 is greater than 𝜃 , what does the hinge theorem tell us about the lengths 𝑐 and 𝑓 ? A 𝑓 is greater than 𝑐 . B 𝑓 is less than 𝑐 . C There is no relation between 𝑓 and 𝑐 . D 𝑓 and 𝑐 are equal. Given that , use the hinge theorem to find the range of all possible values of in the figure. Consider triangles and in the figure. Without completing any calculations, use the hinge theorem to determine whether is greater than, less than, or equal to . A is less than . B is greater than . Given that 𝐶 𝐸 = 5 𝑥 − 1 1 and 𝐶 𝐵 = 9 , find the range of all possible values of 𝑥 using the Hinge theorem. In the figure, . Use the hinge theorem to find the range of all possible values of .